Irish comedian David O'Doherty has won the If.comedy Award, the main prize at the Edinburgh Festival Fringe, for his stand-up show Let's Comedy. His "utterly delightful" routine was packed with "laughter and charm", said awards director Nica Burns. The best newcomer was Sarah Millican, for her show about divorce. Last year the main £8,000 prize was won by Australian comic Brendon Burns, and ex-Cambridge Footlights member Tom Basden was judged the best newcomer. 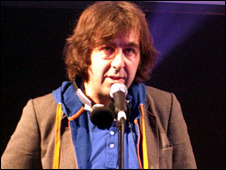 The other nominees for the headline 2008 award were Welshman Rhod Gilbert, English stand-up Russell Kane and American double act Kristin Schaal and Kurt Braunhohler. Losing out on £4,000 in the best newcomer category this year were ex-doctor Mike Wozniak, with his first solo show, and Pippa Evans, for a routine about lonely people. The accolade has been presented every year since 1981 and was known as the Perrier Award until a change of sponsor in 2006. Previous winners include Steve Coogan, Frank Skinner and the League of Gentlemen. O'Doherty, who comes from Dublin, has been performing for 10 years and is a former winner of Channel 4's talent-spotting competition So You Think You're Funny? 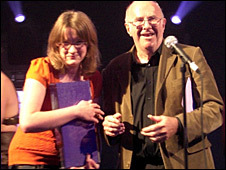 Presenting the prizes were Burns and veteran entertainer Clive James, who has been performing on the Fringe this month. O'Doherty thanked his father, whom he said was a comedy fan, and his brother, who is a writer, for helping him to break into the world of stand-up. He paid tribute to his fellow nominees and said the role of comedians in 2008 was to "explore the dark recesses of our own minds and come up with the best shows we possibly can". "I guess that's the idea of comedy that I've been working from," he told the audience at the Jam House venue. Backstage after accepting her award, Millican said: "I feel less sick than I did 20 minutes ago, and I feel accepted, I think." And waiting for the announcement had been a nerve-wracking experience, she admitted. "You want to win, but if you do win, you have to go up and say something - so that's scary," she told the BBC News website. "Then if you don't win, will your face say that you're pleased for the other people? "I'm quite easy to read and I was worried it was going to be really, really obvious that I was naffed off if I hadn't won."